In the foothills of the Andes, Villavicencio vacations focus primarily on the surrounding natural wonders. You'll discover tucked-away gems like Plaza los Libertadores and Parque Fundadores. It doesn't end there: stroll through Parque Banderas and pause for some serene contemplation at Catedral Nuestra Senora del Carmen. For where to stay, ratings, maps, and tourist information, refer to the Villavicencio trip itinerary builder. Panama City, Panama to Villavicencio is an approximately 8-hour flight. Traveling from Panama City in November, expect slightly colder with lows of 70°F in Villavicencio. Wrap up your sightseeing by early afternoon on the 26th (Sat) to allow time for the car ride to Bogota. Kick off your visit on the 26th (Sat): take in the awesome beauty at Mount Monserrate, explore the world behind art at Museo Botero del Banco de la Republica, then browse the collection at Luis Ángel Arango Library, and finally examine the collection at Gold Museum (Museo del Oro). For more things to do, other places to visit, ratings, and tourist information, read Bogota vacation trip planner. You can drive from Villavicencio to Bogota in 2 hours. Alternatively, you can take a bus. In November, Bogota is cooler than Villavicencio - with highs of 67°F and lows of 48°F. Wrap up your sightseeing on the 27th (Sun) to allow time to do a combination of to Zipaquira. A tour of Zipaquira, the salt-mining capital of Colombia, remains one of the best day-trip ideas from Bogota. Kick off your visit on the 27th (Sun): pause for some serene contemplation at Salt Cathedral and then take in the architecture and atmosphere at Catedral Diocesana. For maps, where to stay, reviews, and tourist information, use the Zipaquira online itinerary creator. You can do a combination of from Bogota to Zipaquira in 1.5 hours. In November, daytime highs in Zipaquira are 67°F, while nighttime lows are 48°F. Finish your sightseeing early on the 28th (Mon) so you can do a combination of to Villa de Leyva. Positioned away from major trade routes and exploitable resources, the colonial town of Villa de Leyva has been largely left alone--leaving a window into the 16th century that has become one of Colombia's most popular attractions. On the 28th (Mon), take in the architecture and atmosphere at Iglesia de Nuestra Senora del Rosario, then explore the activities along Pozos Azules, then engage your brain at Centro de Investigaciones Paleontologicas - CIP, and finally admire the striking features of Casa Terracota. To see where to stay, other places to visit, more things to do, and more tourist information, use the Villa de Leyva trip itinerary builder. Traveling by combination of from Zipaquira to Villa de Leyva takes 3.5 hours. November in Villa de Leyva sees daily highs of 67°F and lows of 48°F at night. Wrap up your sightseeing on the 29th (Tue) to allow time to do a combination of to Iza. Iza is a town and municipality in Boyacá Department, Colombia. 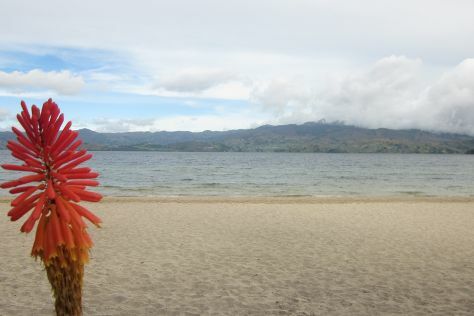 Discover out-of-the-way places like Pueblito Boyacense and Lago Tota. Get out of town with these interesting Iza side-trips: Boyaca (Cabana Buenavista lago de Tota & Playa Blanca) and SocialTour (in Mongui). Next up on the itinerary: don't miss a visit to Parque Central y Feria Dulce de Iza. To find maps, traveler tips, other places to visit, and tourist information, go to the Iza holiday planner. Traveling by combination of from Villa de Leyva to Iza takes 2.5 hours. When traveling from Villa de Leyva in November, plan for somewhat warmer days in Iza, with highs around 78°F, while nights are warmer with lows around 78°F. Wrap up your sightseeing on the 1st (Thu) early enough to do a combination of to Bogota. 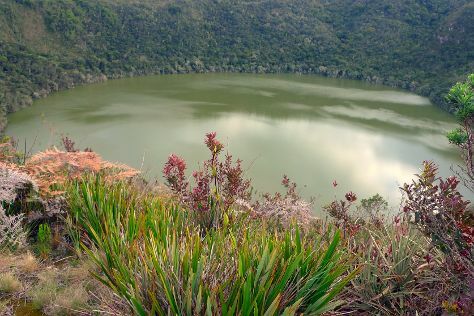 On the 2nd (Fri), tour the pleasant surroundings at Parque de Usaquen and then tour the pleasant surroundings at Laguna de Guatavita. Keep things going the next day: take your sightseeing to a higher altitude at Mount Monserrate, then explore the world behind art at Museo Botero del Banco de la Republica, then get lost in a book at Luis Ángel Arango Library, and finally see the interesting displays at Gold Museum (Museo del Oro). To find ratings, where to stay, other places to visit, and tourist information, read Bogota trip builder. Traveling by combination of from Iza to Bogota takes 6 hours. When traveling from Iza in December, plan for little chillier days and much colder nights in Bogota: temperatures range from 67°F by day to 46°F at night. Finish up your sightseeing early on the 4th (Sun) so you can travel back home.